Wheel of Fortune, also called a "Money Wheel" owes much of its heritage to traditional carnival prize wheels. Prize wheels debuted at American carnivals in the late 1800s, and they became so popular that giant wheels offering fantastic prizes became major attractions at some amusement areas. The prize wheel, in turn, has its roots in the days of chariot warfare. After a battle, victorious soldiers often contested over the spoils of their fallen enemy. Trying to avoid further bloodshed among their troops, commanders encouraged using games of chance to settle disputes. Upended chariots strewn across the battlefield served this purpose nicely - a spear was thrust into the soil next to the wheel to serve as a reference point, and each contestant made his mark on the rim between two spokes. The wheel was given a good spin, and the soldier whose mark settled closest to the spear won the prize without a fight. As time wore on, the soldiers' spinning game made its way to countryside. One adaptation led to the smaller horizontal wheels of Roulette, but the large vertical wheel remained a fixture of festivals because it could be easily seen by a crowd of people. That tradition has carried on to this day at many local carnivals and is even the centerpiece of Wheel of Fortune, a popular TV game show in the US. 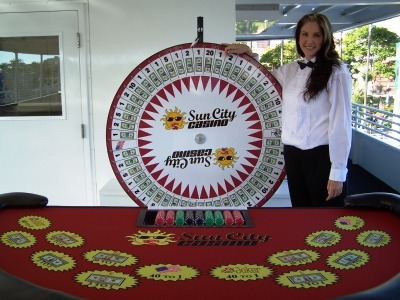 Because of its popularity and easy-to-play premise, the Money Wheel is probably the first game you'll see when walking into most casinos. It usually has a crowd pressing in from all sides, gasping and cheering as the wheel comes to a full stop. Part of the thrill is watching with anticipation as the wheel slows down and each outcome passes by more slowly than the last. Place your bets and join the fun! This article uses material from the website big6moneywheel.com "Big 6 Money Wheel".